My mom used to make this sweet drink with seeds called "hạt é." I never knew what kind of seed it was. I just knew that when mixed with water, the seeds released some coating that made them expand and become chewy. It was a pleasant summer drink that kept us cooled and satiated my craving for juice and soda (which we we were never allowed). Lately I have seen numerous health claims for the new superfood, chia seeds. They seemed exactly like the hạt é I used to enjoy as a kid so I thought they were the same. I wanted to try some but balked at the price ($8 per pound?!?). No way. I remembered my local Asian store sold hạt é and I only needed a little so I went and found some. I noticed the package said "hạt é: basil seeds." I thought it was probably poor translation (that happens a lot actually). I went home and mixed them in almond milk with honey (as many chia seed pudding recipes suggest). After expanding in the fridge overnight, I was excited to try my concoction. Sadly, the hạt é turned out to be different from chia seeds. They are much larger and have more of a peppery taste. I went back to the grocery store and bought chia seeds this time (so determined was I to have chia seed pudding). I'm so glad I did! 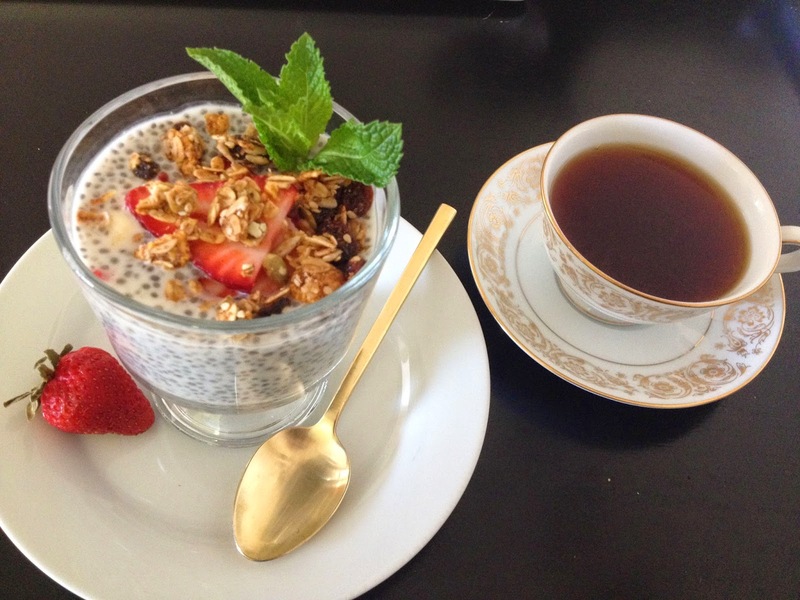 Chia seeds are truly much better consumed as a pudding than basil seeds. The best part is it can be prepared the day before so I have been eating this for breakfast for several days in a row. It is oddly filling and just incredible to look at. A perfect way to start my day!